This week kicks off the 2013 National Cherry Blossom Festival, where millions of Washingtonians and tourists will flock down to the Tidal Basin to witness -- and photograph -- Japan’s gift to the United States. While the blossoms are beautiful to behold, they can be tricky to photograph. You might leave frustrated because the scene the camera captured looks nothing like the beauty you just saw. Avoid this experience by keeping these 10 tips in mind. The first rule of composition is even more important at the Cherry Blossom Festival. Expect crowds of people and clusters of flowers. Your biggest enemy will be distraction -- in the frame. One is the magic number. Find one clear subject and work to eliminate everything else that does not lead your eye to it or help tell a story about it. 2. Try ESAD for creative composition. Establishing shot - Take the post card shot first. This is the wide angle photo that shows your viewers your location. Storytelling - Look for images that tell the story of the day for you. What were you seeing, smelling, feeling? Look for ways to tell those stories visually. Angles - Experiment with extreme angles -- left to right, up and down. Nothing transforms a ho hum image like an extreme angle. Details - Pick a detail and take extreme close ups of it. As the saying goes, the devil is in the details, and quite often, so is the impact. You don’t want to get home and find you have a card full of the same kind of photo. If you only shoot the wide shot or close up of the Cherry Blossom, you are missing a world of opportunities. Check out this shot list for ideas. Realtors live by the location, location, location mantra. Photographers should feel the same way about light. Get there during the golden hours for best results. Use front light on the flowers for best color. Try back light on petals to show depth. 5. Watch out for winds. It is almost always windy -- right when you are ready to take your shot. Flowers on thicker trunks might not sway as much as those at the end of thin branches. Use a clip or have someone steady the branch while you shoot your close up. Fast shutter speeds might be necessary to help stop the action of swaying flowers. In many cases, you might need to use a higher ISO to create faster shutter speeds. A large reflector can do double duty. It can help shade or reflect light, and it can help shield some of the winds. This can be a very handy tool. 8. Fill the frame with texture. The flowers are beautiful, but the weathered trunks have their own character. Fill the frame with texture to show the contrast from the petals. 9. Take a background or prop. Just because you are outdoors doesn’t mean you can’t create a studio effect. Take a background to place behind the petals and simplify the image. The Tulip garden behind the Tidal Basin Welcome Center is a good location to try this technique. Use the sky as a background to outline the flowers and create contrast. Go back. 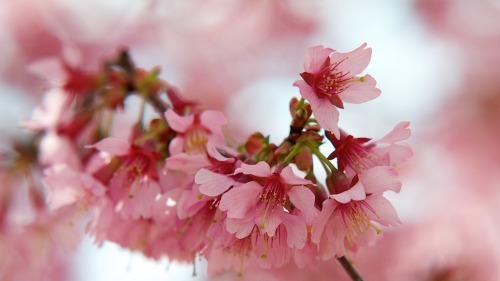 We can expect two to three weeks of blossoms and four weeks of the overall festival. You don’t have to get all your ideal shots in one setting. Plan to return at different times. You can shoot with a pro and get expert advice on creating your ideal shot. Join my PhotoTour DC Cherry Blossom Photo Tours around the Tidal Basin throughout the festival. Let me take you to great locations, help you create great photos, and teach you to master your camera.